EVEN IN THE 1930'S, during Conlon Nancarrow's early days as a composer, his music was hard to play. This is his Toccata, performed in an arrangement for xylophone, marimba, piano, and violin. It was originally written for just violin and piano. But as Nancarrow himself acknowledged, the piano part is humanly impossible to play at the tempo he desired. This arrangement helps by giving those difficult lines to the mallet instruments. Nancarrow was to struggle with his desire to liberate his music from dependence on performers for years to come. He was also to struggle with other matters. In Boston, in the mid 1930s, Nancarrow joined the Communist Party - a decision that was to change his life. In 1937, Nancarrow joined the Abraham Lincoln Brigade fighting the Fascists in the Spanish Civil War. In 1939 - after returning to the U.S. - he went back to composing. Living in New York, he circulated in the art-music crowd, getting to know Aaron Copland, Elliot Carter, and other composers. But his political past was catching up with him. He was refused an exit visa by the State Department because of his association with the Communist Party. Angry - and fearing the situation would only get worse - in 1940 he moved to Mexico City, where he continued to write music. During this time, performances of Nancarrow's work failed due to the incredibly complex tempo relationships he was writing into his work. This piece, "Trio," never made it to its scheduled Mexican premiere because the clarinetist refused to participate, claiming people would think he was playing the wrong notes. One of Nancarrow's main compositional interests was polyrhythm: two instruments or groups of instruments progressing at different tempos simultaneously. And Nancarrow had an idea of how to acheive this vision. In the book New Musical Resources by avant-garde composer Henry Cowell, Cowell suggests using a player piano to accurately reproduce complex polyrhythmic music. In 1947, Nancarrow traveled back to New York to purchase a player piano and a machine that allowed him to punch his own piano rolls. Once back in Mexico City he began work on the "Studies for Player Piano," and for the next 35 years, he did not write for any other instrument. Freed from worrying about whether performers could actually perform the music, Nancarrow developed a body of work that is like no other. Composer John Adams: What really got to me about Nancarrow was that on the one hand there was this wonderful experimentalism and this truly audacious idea of polyrhythms; but on the other hand, the musical material itself was so user-friendly. Over three decades, Nancarrow produced more than 50 of these "Studies for Player Piano." Some are under two minutes; few reach 10. All involved Nancarrow methodically punching thousands of holes in piano rolls, just to create a four- or five-minute piece. He worked in almost complete isolation, rarely playing his work for anyone. Music: Nancarrow, "Study for Player Piano 48a"
Composer and author Kyle Gann, who has written a book on Nancarrow's music, says working in such a vacuum did not seem to bother the composer. Gann: John Cage tells a story that Nancarrow said, "When I think of music I only think of my music." And that is sort of the impression he gave. But he almost seemed to inhabit a planet that didn't have much other music on it that he respected. But there was some . . . Although he composed the music and punched the holes for his player piano, Nancarrow couldn't actually play piano. He admired the great jazz pianists such as Art Tatum and Earl Hines. This is Earl Hines playing "Diane." In this you can hear the staggered melodies, block chords, and runs that Nancarrow was to turn into something very new. In the '50s and '60s, Nancarrow gained some recognition, mostly from other artists. But it wasn't until the '80s that he got wider recognition and began participating in festivals and attending performances of his music. He made a trip back to the states in 1981, his first since 1947, and he attended a concert where they played a tape recording of some of his "Studies for Player Piano." 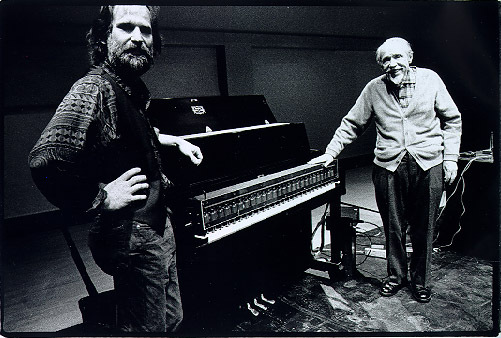 In 1982, Nancarrow was awarded a MacArthur Foundation "genius grant" of $300,000. This further fame resulted in Nancarrow being asked to accept commissions for new pieces. He began, after 35 years, to write for human performers again - partly due to the large sums he was offered, but also because he was encouraged by the level of technical ability now being shown by performers. Nancarrow's original piano rolls were purchased by the Paul Sacher Foundation, although Kyle Gann says this was not Nancarrow's original plan for his creations. Gann: His wife Yoko would ask him what she should do with all those player piano rolls. And she said that he would just shrug and say "burn `em." He never gave the impression that it was important to him to get his music out, or to get people to hear it. 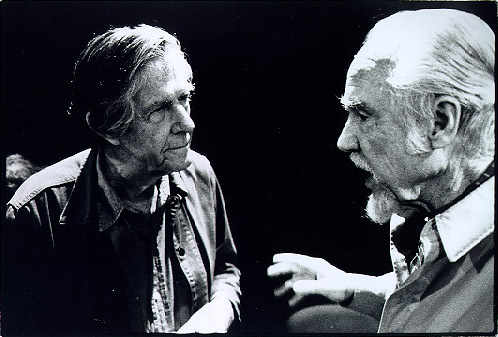 Conlon Nancarrow died in his Mexico City home in August 1997 at age 84 - and given the isolated life he led, it's not surprising that many people don't know his name. But many composers list Conlon Nancarrow among their influences. Kyle Gann says composers seem drawn to the complex nature of Nancarrow's music. Gann: When I first started off analyzing Nancarrow's music for my book, I expected to find all kinds of cute technical ideas that nobody else had thought of. What I didn't expect to find is how well worked-out the ideas are, what new contrapuntal techniques that nobody had ever used before. I didn't expect any of that. This scholarly interest gives some assurance Nancarrow will likely grow in importance over the years. And maybe someday a larger audience will get to hear first-hand these piano pieces of his, playing from the original rolls. But for now, we'll just have to sit back, close our eyes and imagine this piano, its bench empty, flying into amazing flurries of action as these pieces come twirling off the roll.